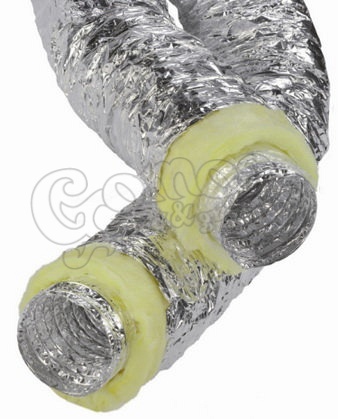 SONOFLEX (Silent Insulated Flexible Duct) is a range of fully flexible thermally and acoustic insulated ducting, which has been specially designed for the HVAC market. The vapour barrier prevents condensation forming on the outside of duct carrying air at lower temperatures than the surrounding air. The SONO+ range has been developed to reduce cross talk and noise generated by inner duct components. SONO+ has been constructed using a microperforated ALU+ , INNERDUCT (you can choose use a film of Polyester covered to prevent the glassfibre to enter into the airstream), 25 mm thick fibreglass insulation and a vapour barrier JACKET+ or one of the types of ALU+. The Jacket used is either a spirally produced multi-layer Aluminium/Polyester Laminated Construction or a Metalized Polyester Jacket. Since all the individual components of the SONO+ products are assembled at the production plant, you can make your own combination you need for your application. Already a selection has been made as described underneath. Can be easily cut at the required length and taped at both sides (sound attenuator). Supplied in standard 10 metre length, compressed to 1-1.2 metre. Diameter.available from 3" ~48" ( 076mm ~ 1200mm). In cases of a fire no toxic gases are emitted.